42/47 Amanda Jones Only nostalgia for Harrison Ford as a credible action hero made this film remotely tolerable. 45/68 Michael Bentley There are a few fun moments, and some of the thrills work, but it's little more than ho-hum formulaic action. 136/159 David Mumpower Harrison Ford did a better version of this movie in 1988. Rent Frantic instead. 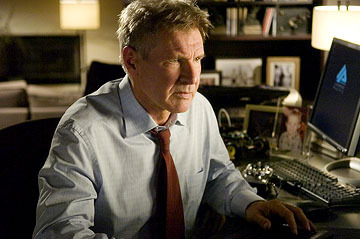 Harrison Ford is ready to place his recent career difficulties behind him. The aging actor has picked the perfect project to enhance his commanding presence while not emphasizing that the bloom is off the rose. Firewall is that project. Ford has been cast as a successful security chief for a global conglomerate. He finds himself a pawn in a dangerous game when he receives word that his family has been kidnapped. The ransom that will save his family's life is $37 million, money he does not have and the robbers know it. Instead, the kidnappers are forcing Ford's character to rob his own bank. They know that he is the only person who fully appreciates all the safeguards in place as well as the weakest points in the system. The security expert is obviously reticent to help, but he has few other options initially. The situation becomes more dire when he realizes that he is being set up to be a patsy. Once the heist is completed, all traces of the existence of the real thieves will vanish. The chief's bosses will be left with the inescapable conclusion that he has embezzled the money for himself. What follows is a game of cat and mouse as the kidnappers and Ford's character engage in high stakes intellectual warfare. They try to force him to commit one of the largest thefts in history. Meanwhile, he tries to use his security expertise to pin down their location, thereby becoming the hunter instead of the prey. See the latest developments for this project on the Firewall Movie News page.